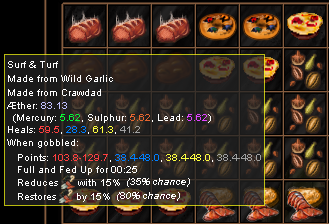 Rifmaster wrote: The pest morel is already a great food to spam in the early days of an expedition, not sure why it needed to be easier to make. It's not like rabbit cuts are difficult to get. Is there a new number, to the right of my right humour? My number is 4 and my madness is 3 (for playing the game), so what does it mean? Some clients tell you your madness level this way. You need to reduce your madness by: smoking tobacco, sleeping 8+ hours with teddybear, or using a hookah successfully. In the future avoid gaining insanity, or work to reduce it by studying, picking flowers, and a variety of other activities. Rifmaster wrote: Surf & Turf is already a great food, one capable of giving 160-180 in a humour when its high purity. Have you ever made surf and turf? That is not the biles of a high purity surf and turf. Not even lobster which has the highest multiplier gives that much. I swear everytime I read Rif's posts I become more stupid. Its good but i certainly cant see it giving 160-180 in a humour. Zapt13 wrote: Some clients tell you your madness level this way. You need to reduce your madness by: smoking tobacco, sleeping 8+ hours with teddybear, or using a hookah successfully. Thanks Zapt. Trouble is, this is Concord. Two madness levels from being online when Blood moon occurred. And no way to remove it, other than being online and doing kings orders, trying to reach the hookah. And thus gaining the 3rd level (too much online). According to the wiki, lobsters give 88.4 base max YB so "theoretical" times 2 is 176.8, real would be top at ~80% 159.12, I'd say that at least is close to 160. [edit2:] the numbers in the wiki might be a tiny bit off, as compared to Lusewings screenshot, those stats are more than what the wiki says for crawdad at that %, but less than what it would be according to the wiki while considering the variable 1.05 multiplier as well. Last edited by Taipion on Sat Jan 13, 2018 7:21 pm, edited 2 times in total. Are you sure? I remember making them with 88%-or so lobster and it giving round that much, I could be wrong though.